About the Hike: Far from being disappointed, Lewis and Clark celebrated when the first sighted the Pacific Ocean from Cape Disappointment, a dramatic headland on the Washington side of the Columbia River. Those explorers had trekked over 2,000 miles across the continent. Today the trail up the headland is still inspiring, but the hike is much shorter. It also features several added attractions - a lighthouse, an artillery bunker, and a museum. History: On Nov. 7, 1805, after traveling more than 2,000 miles in their quest to reach the mouth of the Columbia River, Clark exulted in his journal, "Great joy in camp we are in View of the Ocian, this great Pacific Octean which we been So long anxious to See. And the roreing or noise made by the waves brakeing on the rockey Shores (as I suppose) may be heard distinctly." Unfortunately, it wasn't really the ocean. Clark had been fooled by the breadth of the lower Columbia's estuary. The expedition still had eight days of paddling ahead before they finally landed on the north shore and climbed Cape Disappointment to see the ocean itself. Carrying out President Jefferson's orders to establish the USA's claim to the Oregon Country, Lewis planted the expedition's largest American flag on the spot. Difficulty: An easy, 1.2-mile round-trip hike, with 200 feet of elevation gain. Getting There: From Astoria, take Highway 101 across the bridge and north 11 miles to Ilwaco. In the center of town go straight on Loop 100, following signs for Cape Disappointment State Park for 3.4 miles. At the crossroads for the park's boat launch go straight another half mile to the Interpretive Center's parking turnaround. Hiking Tips: At the far right end of the parking lot, climb the broad trail 300 yards to the Interpretive Center. On the way you'll pass the concrete ruins of Battery Harvey Allen, a bunker that housed three 6-inch guns from 1906 until after World War II. Explorable passageways and storage rooms remain. The Interpretive Center itself features walk-through exhibits of photographs, artifacts, and journal entries from the Lewis and Clark expedition. Museum hours are 10 am to 5 pm daily (10 am to 4 pm from November 1 to March 1). 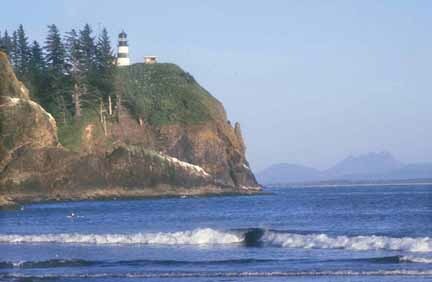 When you leave the museum, turn right and keep to the right to find the trail to the Cape Disappointment lighthouse. After 0.3 mile there's a confusion of trails above Dead Man's Cove, a picturesque chasm in the cape's cliffs. Keep right and go down the stairs to visit the cove's hidden beach, where a shipwreck casualty once washed ashore. Then reclimb the stairs and turn right on a concrete pathway that skirts the cove's clifftops for 0.3 mile to the lighthouse. The oldest lighthouse still in use on the West Coast, this 53-foot brick tower was built in 1856 to cut the appalling frequency of shipwrecks on the Columbia River bar, the "Graveyard of the Pacific." In fact, the ship that originally tried to bring materials for a lighthouse here in 1853 sank with its cargo 2 miles offshore on Peacock Spit.